Guo Xi (c. 1020–90), the distant eleventh-century cultural figure, wafts as a buoyant toponym on the mirage-like horizon of Laubiesian Studies. How disposed should we be to this ominous placement, this transference of securities to a small group of investors? 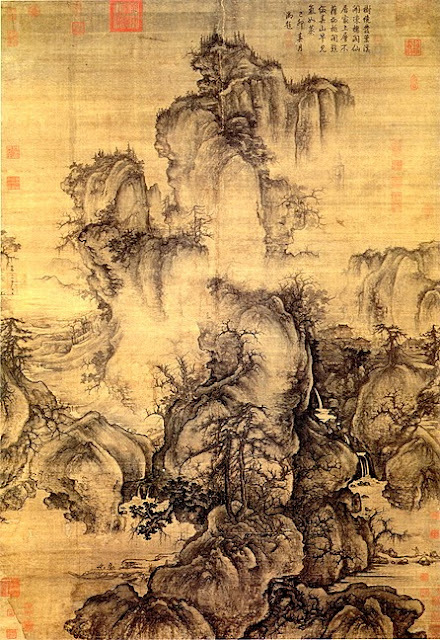 Spelt also typically "Kuo Hsi," "Khuo-Chi," et cetera, Guo Xi (郭熙 / Japanese Kaku Ki), as legend has it, was a court professional landscape painter and aesthetician of the Northern Song dynasty. As a highly lettered or literati painter, Guo Xi developed an amply personal and detailed system of idiomatic brush strokes that proved influential for later painters. He is typically attributed to having produced a treatise on landscape painting. In his best known painting titled "Early Spring," dated 1072, Guo Xi demonstrates his innovative methods for producing an amalgam of perspectives, which he called "the angle of totality." Cautionary note on transliteration: Subsequent researchers should not be confused by the varied spellings of the painter's name. Aside from the two most common appearing – "Go Xi" and "Kuo Hsi" – and which alone in the eyes and the ears of the uninitiated, seem in themselves to be hugely divergent – the following variants are also attested: "Khuo-Chi" (Harambourg 1998), "Kouo-Hi" (Abadie 2003), "Kuo-Shi" (Cloutier c. 2006-7), and lastly, the eminently proper "Guō Xī" with finalising Hanyu Pinyin tonal marks. Reasons for the appearance of these wildly diverse orthographic outcomes are due in large to the historical presence of not less than nine different, often competing, and perceptively dissimilar Romanization systems of Mandarin transcription that arose in the nineteenth and twentieth centuries. The two most universally recognised conventions are clearly Wade-Giles and Hanyu Pinyin. However, deeper confusion arises from the fact that in our current attempt to place Guo Xi within a formal Laubiesian Studies framework, we invariably rely upon textual materials that are generally the product of Francophone discourse. Puzzlement is therefore bound to arise from the way in which earlier generations of French scholars had presented Chinese words in the dress of their own distinctive Ecole française d'Extrême-Orient transcription scheme that was instituted in the 19th century – a system, moreover, that even the French found difficult to pronounce without first knowing its intricacies (Ware 160, n. 5). In recent times, however, Hanyu Pinyin has nearly replaced all other Sinitic Romanization schemes and is increasingly seen in parts of the world where the Latin alphabet is the norm. Abadie, Daniel. 2003. Texte écrit à l'occasion de la publication du catalogue René Laubiès édité par la galerie Alain Margaron (Août). Cloutier, Guy. N.d. [c. Winter 2006-7]. Untitled document. Harambourg, Lydia. 1998. L’Ecole de Paris, 1945-1965: Dictionnaire des peintres. Ware, James R. 1932. Transliteration of the Names of Chinese Buddhist Monks Author(s), Journal of the American Oriental Society, Vol. 52, No. 2, (Jun. ): 159-162.